Launchpad shows a fading transition anytime it is opened or closed, making for a nice effect over whatever is in the background. It’s pleasant looking, but if you don’t like it you can disable the fading with a few defaults write commands. 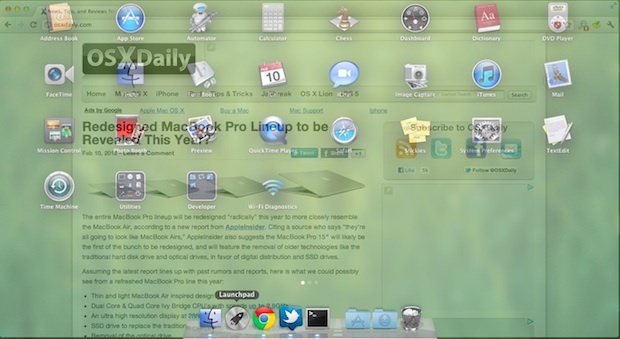 You can also choose to disable only half of the transition, either for showing or hiding Launchpad. Launchpad is a subprocess of the Dock so killing the Dock forces Launchpad to reload, and the change will be immediately noticeable when you open Launchpad again. Gone is the smooth transition, and now it’s a sudden switch, almost like changing desktops but without the side scrolling animation. If you only want to disable half of the effect, say for when Launchpad is being hidden, only use the defaults write command with “springboard-hide-duration” in the string. Launchpad will now be back to it’s usual self with the fading transitions. If you’re not certain, hold down the shift key and see if the transition is in slow motion. Can’t bring back the trasitions (command not found). Please help!!!! What is the precise command you are using? I can assure you the commands work, I just double checked. And hit return again. The Dock will refresh and transitions will be back. Having the same problem to revert, help! « Redesigned MacBook Pro Lineup to be Revealed This Year?